Andrew Tenreiro, 8, of Fairfield, prepares to tee off at the fairway for the fourth hole, through bookcases, at Fairfield Woods Branch Library's Mini-Golf Extravaganza on Sunday. Miniature golf made for some major fun Sunday at the Fairfield Woods Branch Library. 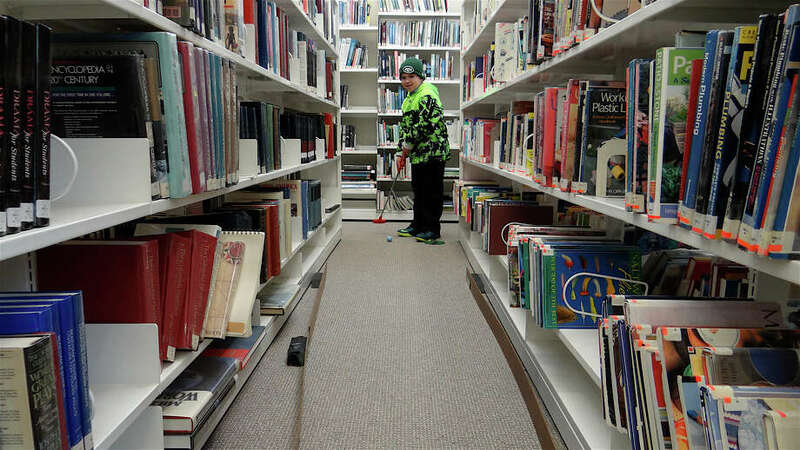 The Friends of the Fairfield Public Library took a swing at sponsoring for a second year at a "Mini-Golf Extravaganza," attracting golfers of all ages and abilities to miniature links laid out through the building -- weaving around bookcases, lounges and hallways. Hazards included inflatable lobsters, mini palm trees and even pizza boxes. Holes were marked by numbered flags and scorecards were provided to participants.